This is by far the most common question when buying a chain lube for your bike. 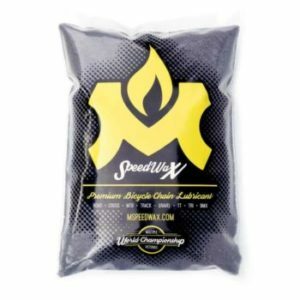 Which bike chain lube should I get? Dry or wet? Perhaps ceramic? Since chain lubes are designed for a specific usage, it all depends on your type of riding and your local area. Sometimes you need a dry lube, other times wet lube or maybe even ceramic lube. The words PTFE, Teflon, Paraffin wax, boron nitride, wax and ceramic are enough to confuse most of us who’s not a science geek. 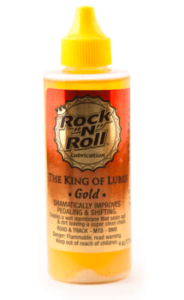 Today, there are hundreds of chain lube choices available. Sometimes, the more choices we have, the more confused we get. 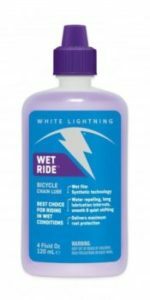 Here’s my top 10 picks for road bike chain lubes. This case mount is compatible with iPhones only, but it fits a range of models and sizes. The magnetic quick locking mechanism means you can grab your iPhone for a photo or a pit stop without a struggle. The Morpheus Labs’ case is slim and streamlined, too. For cyclists who want a quick and flexible mount for an iPhone, this is a great option that’s functional and maintains a minimalist vibe. If you thought that all chain lubes are created equal, think again! In the not so distant past, most people figured that WD40 did the trick to get the drivetrain running smoothly. After all, it was just about getting that squeak out, right? 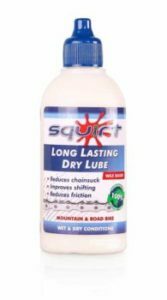 As the name implies, dry lube is meant to be used in dry conditions. They’re ideal for spring and summer. Ideally, you’d want to lube the chain the night before your ride so that it can penetrate and coat the chain links thoroughly. There are 2 types of dry lubes : Wax (Paraffin) and Teflon (PTFE). Teflon is found in most dry lubes today. Even though they do collect more dirt and dust wax lubes , they’ve a very low friction coefficient, giving you a very smooth chain. Pros. Dry lubes are lighter lubricant, they're less sticky and hence, attracts less dirt. As a result of that, you'll usually get a cleaner drive chain and less cleaning required. Cons. Because they're a lighter lube, they'd get washed off easily when it's wet. Sometimes, you'll need to re-apply the dry lube every 80 to 100 miles to prevent drivetrain squeak. Wet lube is meant for use in wet conditions. If you live in a damp and humid environment that sees a lot of blustery weather or winter time snow, then consider going the wet lube route. Wet lubes are usually oil-based. They’re thick, sticky and water-resistant. Thicker wet lubes are more water-resistant, but they also attract more dirt. Pros. A major advantage of using wet lube is that they do last longer in terms of mileage per application. Cons. Because they're sticky, they easily attract dirts and dusts, often causing a drivetrain that is filled with grime. Ceramic lube is the next generation of bike chain lube. 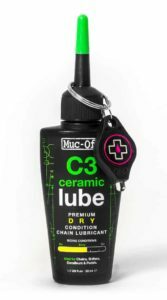 The ceramic lube need to thoroughly penetrate (preferably left overnight) the small bits of your chain such as the pins and rollers. Those are the pieces that need to be cleansed and protected. Nothing does the job quite like ceramic lube which uses microscopic pieces of boron nitride to keep your drivetrain clean and as frictionless as possible. Ceramic lubes cost a little bit more than the usual dry and wet lubes. But if you’re running an expensive drivetrain or just care a lot about your road bike, the extra cost is well worth it. 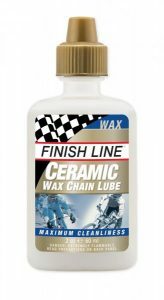 If you want to be really ahead of the curve, then there is ceramic wax lube, a very effective way to keep your drivetrain nice and neat with the best of both chain lube worlds, ceramic and wax. 1. What is the bike chain lube made of? The ingredients of the chain lube is often a secret. Manufacturers consider them their secret sauce which differentiates them to their competitors. Having said that, there are several common ingredients are boron nitride, synthetic oils, Paraffin (wax) and Polytetrafluoroethylene (PTFE). PTFE is more commonly known as Teflon, which is a registered trademark owned by DuPont Co.
Teflon is the same chemical used to coat the non-stick frying pans. 2. How do I apply the chain lube? Ideally, you’d want to lube your chain when it’s clean. But realistically, this doesn’t always happen especially if you’re using dry lubes. The chain lubricant might dry off and your drivetrain starts to squeak before the next time you clean your bike. Here are 3 easy steps to lube your road bike chain. Use a clean rag and wipe off any grime from the chain. Wrap the rag around the chain and spin your pedal backwards. Use a chain cleaner to get even better results. Apply a drop of chain lube on every roller (not the face plate). Wipe off any excess with a rag. 3. How often do I need to lube my bike chain? It all depends on where you ride. As mentioned above, dry lubes would need more relubing as compared to wet lubes. As a rule of thumb, you’d want to wipe your chain every 80 to 100 miles if possible. The more you ride, the more cleaning and lubing is needed. If you start hearing squeaks, then it’s time to relube the chain before the squeaks get louder. This is very common especially if you ride in the rain as the rain water tend to wash the lube off the chain. 4. 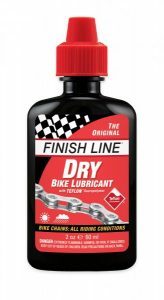 Can I use other types of lubes on my bike chain? It’s not recommended to use other lubes other than bike chain lubes on your bike. Many beginners made the mistake of using WD-40 to lube their bike chain. Afterall, WD-40 prevents squeaks right? You’d want to stick with bike lubes if you want to squeeze every bit of mileage from your drivetrain. Avoid motor oils such as engine and gear oils, as they tend to be much heavier than a wet lube and attract a lot of dirt very easily. 5. What factors affect a chain wear? Dirty Chain. The most common factor that affects chain wear is a dirty chain. Keep you chain clean and well-lubed after every ride. Usage Conditions. Dirt, mud, sand and water can lead to increased friction between the chain links and cogs, leading to faster chain wear. Drivetrain Conditions. A new chain used with a worn out cassette/chainring will wear very quickly, and vice versa. Riding Style. If you pedal with a lot of torque (think of low rpm) or power (think of climbing), the chain will wear quicker. That’s why the pros use up to 10 chains throughout the 3 weeks Tour de France. The best way to extend the chain’s lifespan is to have it well lubed and cleaned whenever it’s dirty. You might also want to consider getting a chain checker as part of your bike tool kit.